Ken and his team have completed a third project in our home. We invited Ken back without hesitation because we were so incredibly happy with the previous two projects. He recently helped bring our vision of taking 3 very similar bathrooms through a redesign with the end result being 3 completely different rooms. As always, Ken listened and guided us on our journey and then took our ideas and completed 3 amazing and bathrooms. At the same time he also orchestrated the redo of our front entrance and stairway; again taking our ideas and creating a breathtaking entrance to our home. We cannot say enough about Ken and his team. Attention to detail is a top priority and Ken's workmanship is second to none. Being in someones home on a daily basis and not being intrusive is a skill his team has mastered. We have thoroughly enjoyed working with Ken and are very pleased with the end result - and know others will as well. 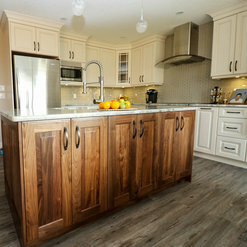 We are in the process of having a kitchen Reno done by Mod Kitchens. We are in the final stretch and are very satisfied so far. Ken's trades have gone out of their way to please us. They clean up thoroughly at the end of each day and are very courteous and respectful. I recommend Ken to do your work! After 19 years of daily frustration with our small and inefficient kitchen (you could actually touch the stove, the sink, and the fridge without moving!) we decided to investigate a possible kitchen renovation for our 42 year old house.We contacted Ken at Mod Cabinets, a local business in Fort Saskatchewan, and arranged an initial meeting where we discussed our wish list. Ken listened intently, made suggestions, and answered our many questions. When the time came to view the design, I have to say that we were excited, but also worried that the design might not live up to our hopes and dreams. Well, all I can say is, we didn’t need to worry. We were sold on going ahead with the renovation the minute we saw Ken's design.Ken has an amazing group of people working with him, and we found everyone involved in the project to be very professional, friendly, and detail oriented. 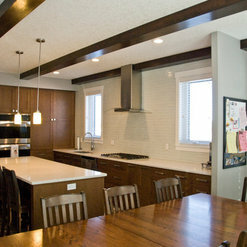 During the renovation, we appreciated that attention was paid to the existing house. The hardwood floors were covered with paper, the existing cabinets were dismantled and removed with minimal dust, and plastic was hung to keep dust to a minimum when the ceiling was patched and re-textured and wall patches were sanded. 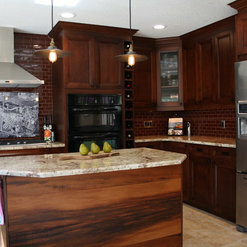 We highly recommend Mod Cabinets, and wouldn’t hesitate to use them again. We absolutely love our new kitchen. Our only regret is that we didn’t contact Mod Cabinets sooner. 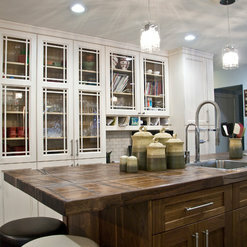 If we had, we could have been enjoying this wonderful kitchen much sooner. Thank you for the wonderful review, it was a pleasure working with you! 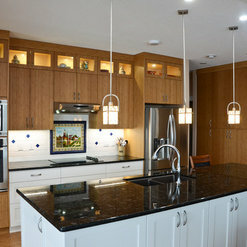 It is my privilege to recommend the work of Ken Bergman of MOD Cabinets. Ken and his team did a complete kitchen renovation for me in 2016 and did an excellent job. I am so grateful that I chose Ken to do the project. My kitchen is a general octagon shape so it was very challenging to do the design as well as the construction ensuring that all the angles were precise. 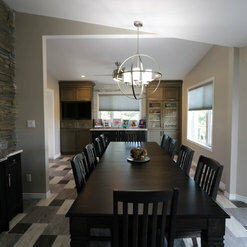 Ken and his team were very meticulous in their work and each phase of the project turned out very well. In addition to the excellent craftsmanship, Ken was exceptional to work with. He provided many options, thought outside of the box in the design and was patient as I worked through the different options to determine what would work best for me. He was always available to answer questions (and I had many!) But most of all, I appreciated his integrity and honesty with respect to the contract details – I always felt that I was being treated fairly and that he was doing the best to ensure that I would be satisfied with the project once it was completed. In short, I am a very satisfied customer and would highly recommend Ken for any new construction or renovation project. In fact, I hope to use Ken’s services in the near future for a bathroom renovation! Ken worked extremely well with our ideas and put them all together, great sub trades, counter top guys were awesome. Cabinets are top quality. Thanks for your positive review! Great to work with you guys. 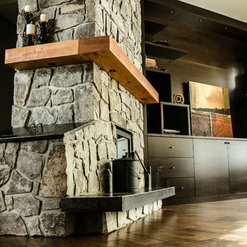 Ken was recommended to us by a couple of people who had hired him to do renos at their homes. We met with Ken and knew that it was going to be a good fit for us.Ken had a lot of great ideas and was more than happy to listen to and include any of ours. He was quick to deal with any of our concerns, and even to allow additions to the reno mid way through it! Ken, himself, and the people that work with/for him were amazing! We lived in the basement throughout the reno so we were in contact with them every day. They were friendly, professional, clean and very good at what they did.We highly recommend Ken and would definitely use him again! Ken made our dream home for us on time and on budget. It was a pleasure working with Ken and his team to design a home that perfectly meets our family's unique needs. From design to construction to move in, Ken was with us every step of the way. We really appreciated that Ken took the time to understand what we were looking for and offered novel solutions to help us realize our dream. We never felt rushed or pressured to make a quick decision, rather he took us through a very collaborative process. My family and I are thoroughly impressed with the construction quality of our home. Everything is top-notch. Our quartz counter tops are beautiful, as are our hardwood floors, walk-in closets and master ensuite, which is complete with a custom designed Kohler shower system. Every aspect of the house was done to a high quality for a very affordable price. We would highly recommend Ken and his team for any home construction project! We love our new kitchen and bathroom and thoroughly enjoyed the design process. 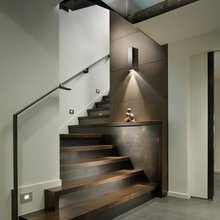 Ken provided many valuable design ideas and suggestions which have proved to be very gratifying. We love the cabinet designs, colors and organization. Ken also took great care in considering our ideas and providing information and options related to them. We especially appreciate the fact that the project was on time and on budget. And finally, we had a great team to work with. They demonstrated skill, knowledge and consideration. 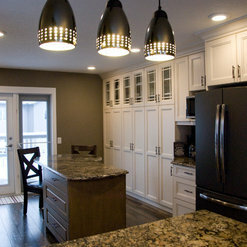 We recommend MOD Kitchens for anyone who desires an awesome renovation experience! From start to finish I found Ken and his team to be professional and reliable. Our renovation included the entire main floor gutted to studs with moving a garage entrance to a different location in our home. 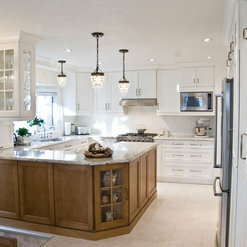 Ken's input into the design of the cupboards and kitchen was crucial in the redesign of the main floor. He was a valuable resource as well for locating other design features such as an authentic barn door and reclaimed wood which we used in the kitchen and family room. I appreciated Ken's knowledge of kitchen and home design and found him to be innovative and respectful of my wishes as well. I really felt that his team went the extra mile to ensure that the job was completed to my satisfaction and to incorporate specific design features into our home. I greatly appreciated that Ken was easy and accessible to communicate with by phone or email, he always returned a call or answered any questions promptly. I would not hesitate in recommending MOD Kichens! We look forward to enjoying our renovated home. We had been ready to have a kitchen renovation for a few years but we had no idea how to find someone who could design and also do a great job. We did have a couple of people out to look at the kitchen but never really connected to us. My husband found MOD Kitchens on the internet and gave them a call. Ken came out a couple of days later and listened to our ideas, measured the kitchen and said he would contact us with some design ideas. He was very prompt and within a few days had some designs sent to us. We loved all the designs and finally decided on one. We went over to his office and discussed what kind of cabinets we were interested in and counter tops we wanted. He gave us a price which could of course change with the granite we chose. We went to his granite person and picked a gorgeous granite that we knew would be extra and is worth every penny. Once we agreed to the contract and the go ahead we were told what day he estimated the cabinets would be here and they were there exactly at that time. His installer worked all Friday - Monday and had the cupboards installed with all the crown molding etc done perfectly. The Monday afternoon the granite company came and measured everything. Ken was also there to help with any questions and we had our granite delivered a couple of days later and installed to perfection. We could not be happier. We had an awkward shaped kitchen that is hexagonal and now it is a beautiful open kitchen with tons of storage. I was also impressed that Ken would come and check regularly that everything was on track! We also had him install new vanities in our 3 bathrooms and the same granite. They all turned out beautiful as well. 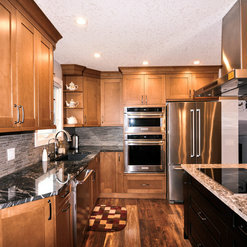 We would highly recommend MOD Kitchens for any renovations! Excellent job! The service was professional and was done on schedule. 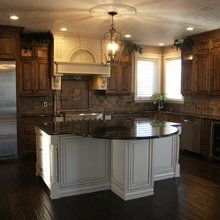 The selection of the Granite counter tops had a very good variety. 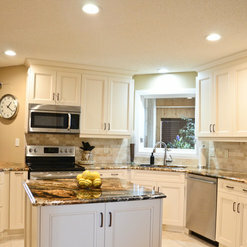 Last year my wife and I decided to renovate our kitchen and Ken helped us from the design stage to the final install. He was always accommodating, very helpful with the design/layout and explained the differences in cabinets and countertops to help us understand better what we really wanted and needed. We highly recommend Ken for any project that you have for your home. I really enjoyed working with you on your project! Thanks for the great review and I hope you enjoy your renovated home for years to come! 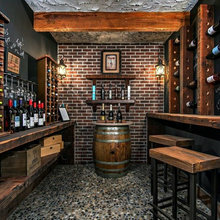 Commented: What type of flooring is on this floor?It is a cork floating floor. Commented: what is the material of this sink?It is a silgranite sink by Blanco. I think the color is Cafe'. Commented: What is the wall paint colorThe paint color here and in the other places you inquired about is called &quot;Deep in thought&quot; by Benjamin Moore. I hope that helps! Commented: Love the chandelier. Can you please tell me where it is from? ThxIt was purchased by the client at Park Lighting in Edmonton, AB. The item number is ICH394A04CH9 but it may not be available anymore. Commented: Can you send me information on the countertop? 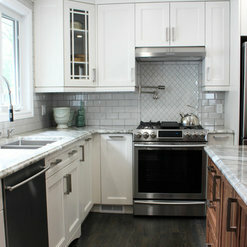 It's perfect!This is one of the rare cases where the client selected and arranged her own countertops. I attempted to contact her but have not heard back.